The Laser CNV model has been a reliable animal surrogate in the development of therapeutics to treat retinal diseases, such as Wet-AMD. The pathogenesis of lesion development and regression appears to be conserved amongst lower mammals, as rodents have been largely predicative of efficacy observed in larger non-human primates, and subsequently in human clinical trials. We sought to develop more robust and reproducible methods for Laser CNV using a Micron III small animal funduscope (Phoenix Research Inc.) which was attached to a thermal laser. 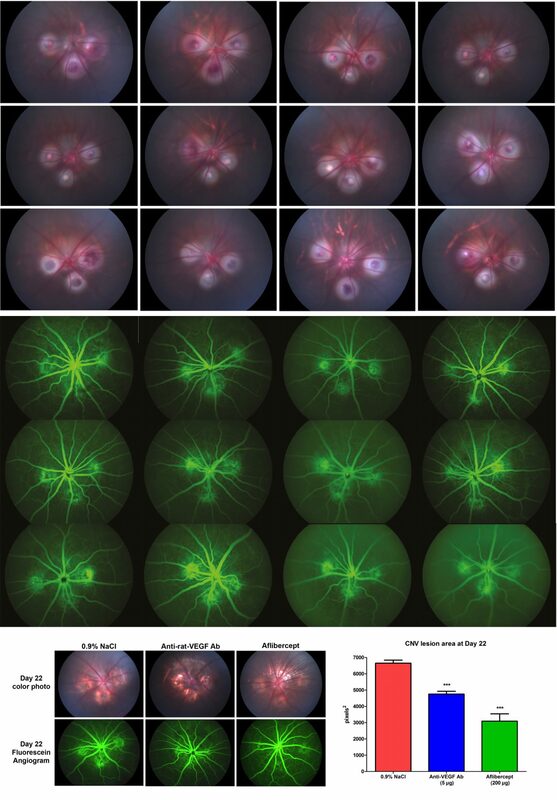 This system allows for the fine manipulation of laser focusing and allows the performance of true non-invasive fluorescein angiography without having to sacrifice the animals. The same eyes can be used for lesion quantification at multiple timepoints and the eyes/tissue can be harvested at study termination for a secondary endpoint, such as ELISA, qRT-PCR, immunoblot, LC-MS/MS quantification of drug, or immunohistochemistry. After examining numerous parameters, including rat strain, age, laser settings, and location of lesions, we developed optimal parameters to ensure successful laser application and penetration of the Bruch’s membrane to produce consistent lesions. We have also identified and validated the use of a rat anti-VEGF antibody for use as a positive control which causes a significant reduction of lesions size and grade of leakage.